Husband Walter and I had planned to forego joining revelers for Mardi Gras parades on Fat Tuesday this year. We were both recovering from his gallbladder surgery. And neither of us wanted to brave the rainy weather that was in the forecast. We elected instead to visit his mom, enjoy lunch at a favorite restaurant then get some walking in at an indoor mall. I had been neglecting that part of my stroke-recovery rehab due to recent cold and rainy weather. When we headed home, Hubby took a chance on a direct route east on U.S. 90. 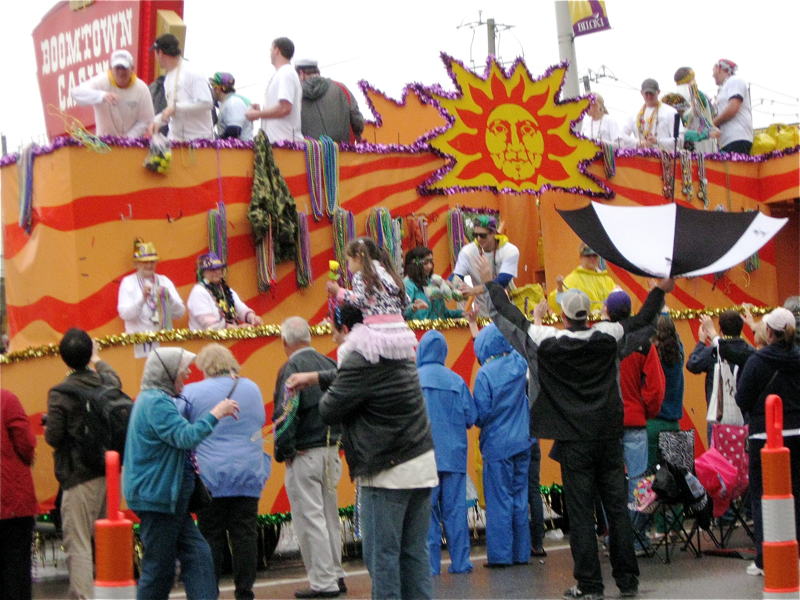 The westbound lanes of the four-lane highway along the beach become part of parade routes during Mardi Gras season. We thought the rain would mean reduced traffic on the eastbound lanes we were traveling and maybe even the delay or cancellation of the day’s parades. 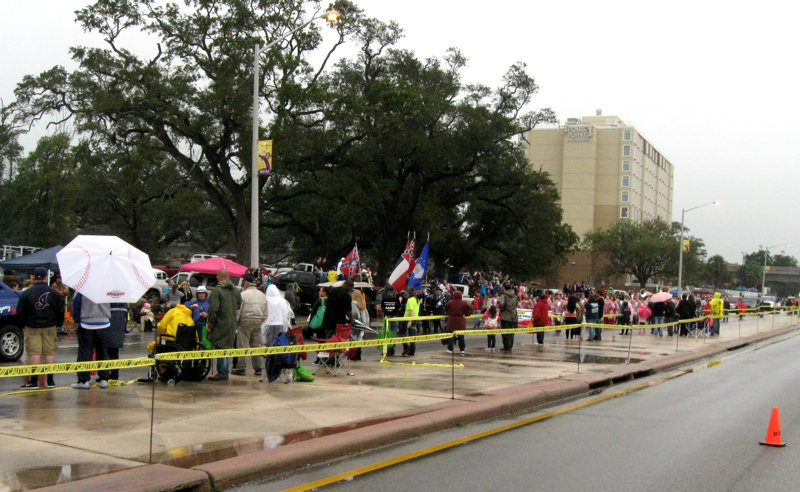 A small but enthusiastic crowd braves rain in Biloxi, Mississippi. Determined revelers lined the westbound lanes, though. And traffic was slowed but not clogged in the east bound lanes. Hubby graciously filled my request to take my point-and-shoot Canon and document our unexpected opportunity for a sampling of Mardi Gras festivities from the high and dry comfort of our van. 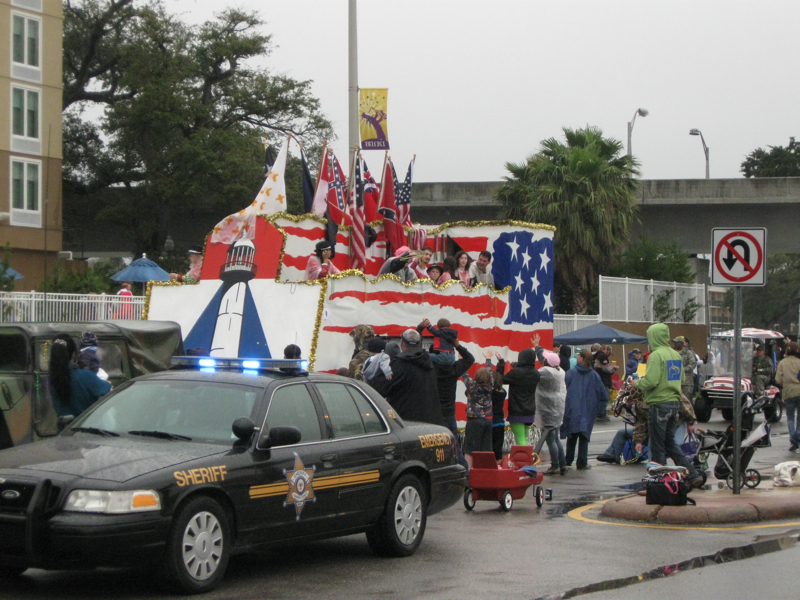 Traffic lights slowed our progress enough that we saw about seven of the 17 floats featured among over 100 different entries in this year’s Gulf Coast Carnival Association parade. 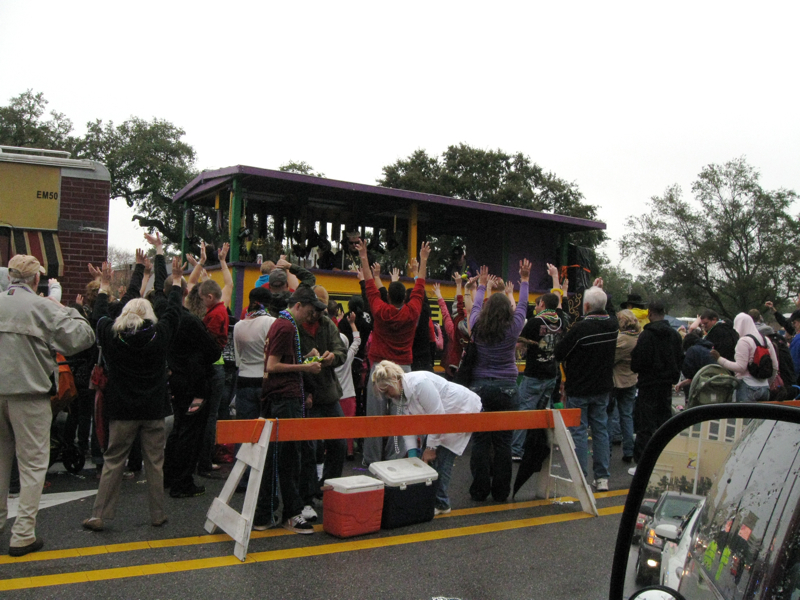 Walter stuck his arm out and waved at the folks tossing beads, stuffed animals, doubloons and other Mardi Gras trinkets from the floats. Some ladies with exceptional strength and accuracy sailed beads right into his hand. The four or five colorful strands did not compare to the “haul” characteristic of past up-close-and-personal parade experiences. And we didn’t see any of the extravagant, professionally designed and crafted floats we have seen in New Orleans. But the fun, laughter and hometown atmosphere we enjoyed in our brief drive-by Mardi Gras was pure Mississippi Gulf Coast merrymaking. Wow! Well, they say that some of the best things are unplanned. Is this the actual Mardi Gras? It kind of passed me by this year, I have seen or heard nothing about it. 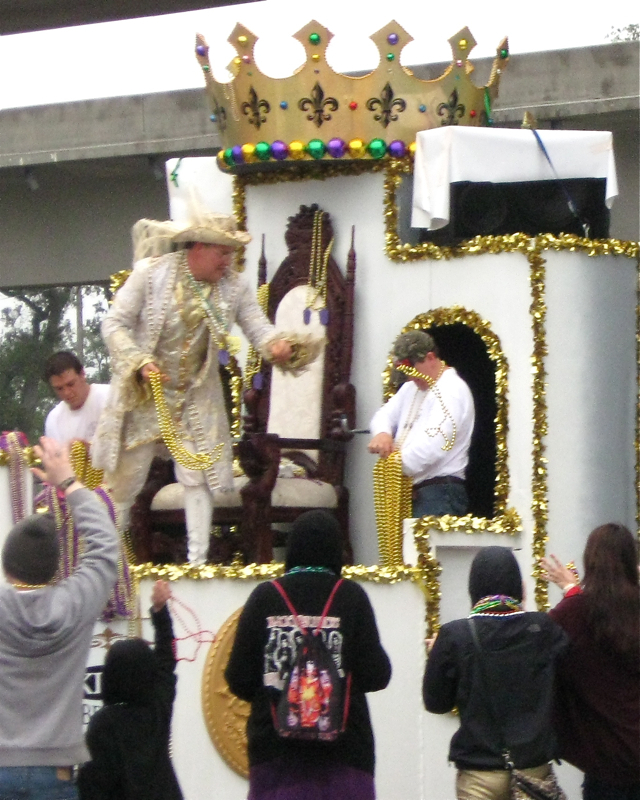 Love this shot of the white king float. good job catching those treasures and i like that last photo..looks like you had a fun time. How nice that you managed to get in on a little of the Fat Tuesday festivities! Those colored beads have always been a favorite of my grandchildren. Great catch, Walter! This is delightful tho damp stuff. Love every bit. I love that you were able to see some of the activities anyway. Good catch for your Hubby too. Hope you are both back on the recovery routine. Sometimes, those spontaneous events are the best! This one certainly sounds like a lot of fun! Glad you had such a good time, Linda. A friend gave me some Mardi Gras necklaces. They make great colorful gifts!